This past week a friend and I discovered a group of rice fields near Sanur that is virtually unknown to tourists, but they’re just as green as any of the others in Bali! A new jogging path through the fields was just added in 2018, but the whole area is still very quiet and I only saw a handful of friendly locals and farmers during the entire hour or two that I spent there. It’s a nice walking path in good condition. You can also take your scooter on it for a nice scenic drive, but where this place really shines is for taking drone photos. I had the whole place to myself and the aerial views were incredible. 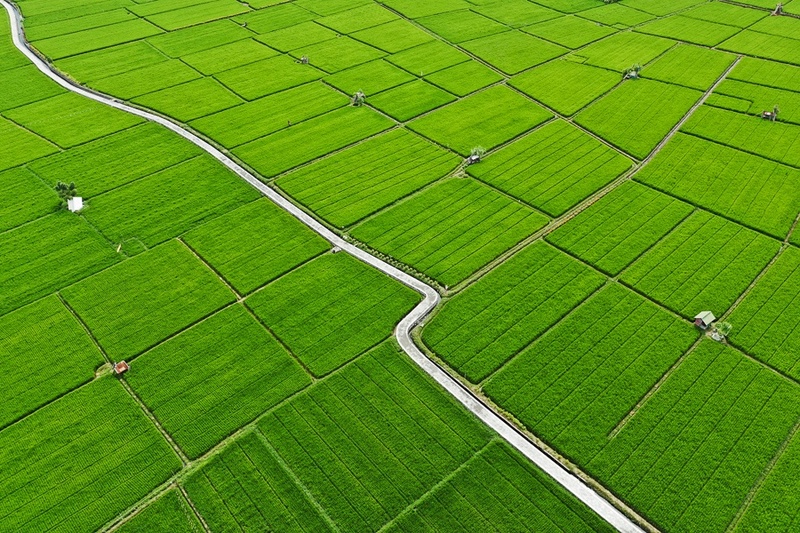 The green rice fields look super photogenic from above, and you can see the patchwork stretching out in all directions. The rice fields are located west of Sanur, Bali. The nearest landmark is Warung Babi Guling Galung. From the warung, walk north 500 yards and you will find the entrance to the jogging path. I only walked part of the path and then turned back. If you walk the full path, it goes on for what appears to be a few miles. Be careful if you decide to step off the concrete path and walk through the rice fields. I did this for a few minutes and saw a green snake by my feet.